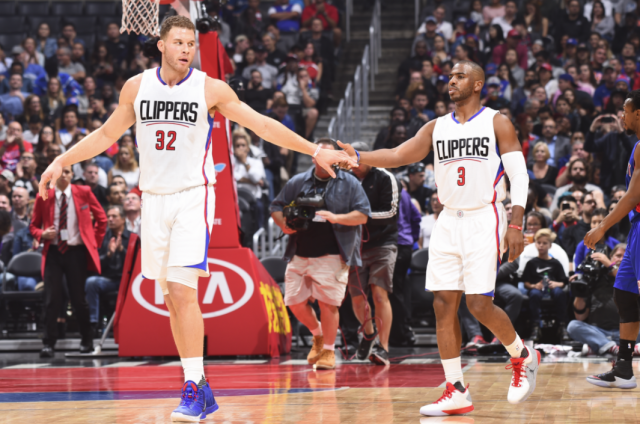 Is This Finally the Clippers’ Year? Since Chris Paul was traded to the Los Angeles Clippers in 2012, a series of coincidences, underperformance and downright awful luck has crushed LAC’s dream of surpassing the second round of the Western Conference Playoffs. But this version of the Clips — the league leading 10–2, defensive juggernaut — may be the light at the end of the tunnel for a historically sorry franchise. Characterized early on as “Lob City”, Paul-led fast-breaks were oft finished with high-flying acrobatics by young stars Blake Griffin and DeAndre Jordan. Now they’ve matured. Griffin (20 ppg, 9 rpg) has expanded his post game while adding a reputable mid-range to three-point shot. Jordan (10 ppg, 12 rpg, 2 bpg) is a world-class rim protector and a perfect complementary big: setting picks, catching lobs and cleaning up any errant shots. And then there’s Paul. The ever-underappreciated captain of the Clips is having perhaps the best start of the season of his career. And that’s saying something. The 31-year-old veteran is averaging 18.3 points, 5.2 rebounds, 8.3 assists and 3.1 steals. This much has been true for the past couple seasons, but for differing reasons they haven’t been able to get over the hump. A capable bench and an improved defense have propelled LA to an early lead in the West. Upon drafting Jordan and Griffin in subsequent seasons, then trading for Paul, the roster was gutted and the message was clear. We believe these three will be with us long-term. And they have been. But besides comparitive mainstays Jamal Crawford (five seasons) and JJ Redick (four), the roster largely gets overturned summer after summer by GM-coach Doc Rivers. The likes of Jared Dudley, Danny Granger, Lance Stephenson, Glen Davis, Josh Smith and Jeff Green — to name a few — have tried and failed to bolster a Crawford-led second-unit over the years. A massive retooling of the second unit — re-signing Austin Rivers, signing Raymond Felton, Mo Speights, Brandon Bass and Alan Anderson — has proved paramount to their 10–2 start. In the past, the first-unit would stay even or gain a lead, and the bench would often lose it. Doc doesn’t believe in staggering his star’s minutes, so Crawford iso’s became the bench’s best play. Sometimes it worked, sometimes it didn’t. It was just clear it wouldn’t ever work in the playoffs. So Rivers improved the bench. Redick is off to a hot-start to the season, 3rd on the team with 14.5 ppg and a couple threes a game. Crawford, Rivers and Speights are averaging a combined 28 ppg and Felton has been a surprisingly steady force off the bench. The offense has never been the issue for the Clip’s — ranking in the top 5 every year since 2011. This season has been more of the same, as they rank 5th in offensive efficiency. The question has been the defense, particularly from the aforementioned second unit. Given Paul and Jordan’s high-ranking defense at the point and center of attack, the starters will be consistently strong defensively. The starting unit of Paul, Redick, Luc Mbah a Moute, Griffin, and Jordan have a stunning defensive rating of 85.4, while as a team their rating is a league-best 96.7. For reference, the Clippers haven’t been under 100 since Paul joined the team. The biggest difference though is when the benches clear. Instead of a predictable drop off, the all-bench lineup of Crawford, Felton, Rivers, Wesley Johnson, and Speights — their second most played lineup — has a defensive rating of 91.1. In the NBA, excelling on offense isn’t enough. It may feel like hyberbole at this point, but it’s true: defense wins championships. Or at least gets you there. Historically, when team’s rank in the top 10 in offense and defense, they at least make the Conference Finals. The Clips are winning this season because they are excelling on offense and other-wordly on defense. The Warriors are other-worldly on offense, and putrid on defense so far. There are other teams, but in a potential matchup, it would come down to offensive execution and whether the Warriors defense can step up. Surely, LA’s defense won’t be so stingy all year, but the very nature of defense points to it’s sustainability. The object of a defense is to make it difficult for the offense and force their opponent into tough shots. They can continue to do that. In the end, it may not matter, as the Dubs are the best in the league at making tough shots. But that’s all the Clips are asking for. A chance.